The Thompson River is a large tributary of the Mid Fraser River. 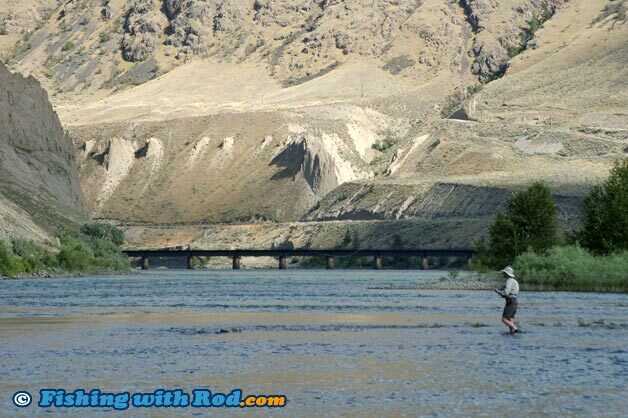 The section from the mouth of Kamloops Lake to Spences Bridge offers trout and salmon fishing in the summer, and steelhead fishing in the fall. Its rainbow trout are known to eagerly take both large dry flies and nymphs, making this a popular destination for fly fishing enthusiasts between July and September. Camping is available along parts of the river, and it is easy to combine your fishing trip with other activities such as swimming and biking. This stretch of Thompson River runs partly along the Trans-Canada Highway from Spences Bridge to Kamloops. Access is available from several provincial campsites. Juniper Beach Provincial Park, just east of Cache Creek, is a popular access point. From the day-use area, you can hike either up or downstream to find suitable fishing spots. The stretch in front of the campground can also be productive. The town of Ashcroft also provides access to the river. Other access points include Walhachin just downstream from the mouth of Kamloops Lake, and the area just north of Spences Bridge. Depending on the river level, summer trout fishing can be productive as early as mid July. Freshet typically occurs until early summer so the river level can be high. If clarity is reasonably good, don't be discourage by the high river level, as trout will simply feed closer to shore in calmer waters. Trout fishing can be done until the river closes in late September, but fishing typically slows down in August due to fishing pressure and possibly lower river level. When openings granted, anglers also have the opportunities to catch chinook and sockeye salmon. This fishery usually occurs in August and part of September. The famous Thompson River steelhead fishery usually begins in October, but announcements of the opening are usually made in the last minute so you need to check the ministry's website for updates. When fly fishing on the Thompson River, most anglers prefer to use a 5/6wt single hand or switch fly fishing rod. Rainbow trout found in this system are typically between 1 and 2lb, the odd fish can run up to 5lb but those are rare catches. A heavier, faster rod is needed to combat the strong wind that can so often pick up in this valley. A good floating line is what you need to spool up, for both dry and wet fly fishing. From the end of your fly line, connect around 9ft of leader to it. A tapered leader can make your cast smoother. Dry flies used for these rainbow trout are usually large. A common one used is the "California Blonde", which seems to work quite well on most evenings. Although the fly is quite large, the takes are often very subtle so you must not take your eyes off the fly during dusk. Nymph fishing can be done throughout the day and bites are not hard to find as long as you keep moving to find feeding fish. Large black stonefly nymphs dead drifted work great. The takes are often quite big so hold on to your rod! Beside fly fishing, you can also target these rainbow trout with a spinning rod. A small spinner or spoon can usually do the trick. Other species that you may encounter while targeting rainbow trout are northern pikeminnow and mountain whitefish. Salmon fishing in this stretch of the Thompson River can be done by either float fishing or casting lures. These fish, unlike the ones found on the coast, can be slightly coloured. Lures such as a big Gibbs Croc spoon can easily entice an aggressive chinook salmon. Thompson River is located in Region 3 in the British Columbia freshwater fishing regulations. The valley can be steep in this section and the rocks can be very slippery, so great care should be taken when trekking along this river. Please respect wildlife and other users by not leaving garbage behind.